You can work with your display campaign audience to build different scenarios for communicating with your customers. For retargeting, use a pixel — special code that can be embedded in advertising materials. The pixel collects the anonymous identifiers of users who saw your ad. Yandex does not receive any personal information about these users. 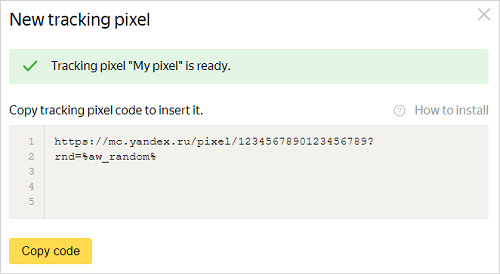 Create a pixel in Yandex.Audience. On the Pixels tab, click Create pixel and enter a name. The pixel code will be generated automatically. For more information, see the Help for Yandex.Audience. 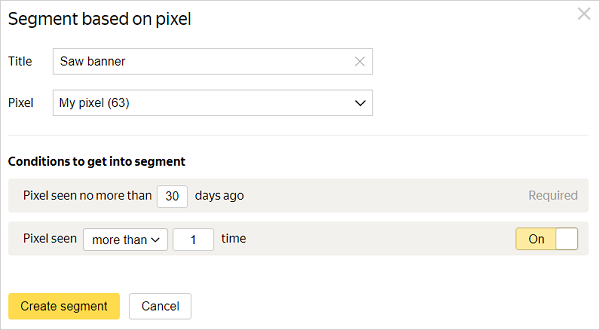 When creating or editing ads in a display campaign, add the pixel in a special field. Once impressions begin, the pixel will start collecting anonymous user identifiers. An impression is counted if at least half of the banner area was continually shown on the visible area of the screen for at least two seconds. Create pixel-based segments in Yandex.Audience. Specify the period to use for the data, and how many times the user must see the ad during the selected period. After processing is complete, the segment must have the status Ready and contain at least 1000 anonymous identifiers. Use your created segment to configure user profiles (in a display campaign or a display campaign with deals) or retargeting lists (in contextual ad campaigns), or bid adjustments. You can build communication strategies of any complexity by using pixel-based segments and serving contextual and display ads. Use a pixel-based segment to reach people who saw your ad. This audience is already familiar with your brand, which means that it is more loyal to the advertised products and services and is more likely to make a purchase. Combine pixel-based segments with other segments to form complex impression criteria. But keep in mind that targeting an overly narrow audience will reduce the reach of your campaign. For example, you can combine a pixel-based segment with segments based on location data. This way you can identify users who have seen the ad and are currently located near your store. Select a new audience that is not familiar with your brand yet. Set a negative condition for people who have seen your ads and visited the site.